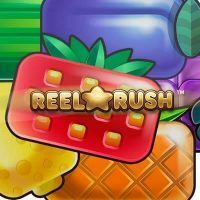 Reel Rush is an innovative online slot by Netent, that may seem a bit childlike because of the bright colours and juicy fruit candies. It all looks and sounds a lot like Nintendo’s famous Mario games. Don’t let that first impression fool you. 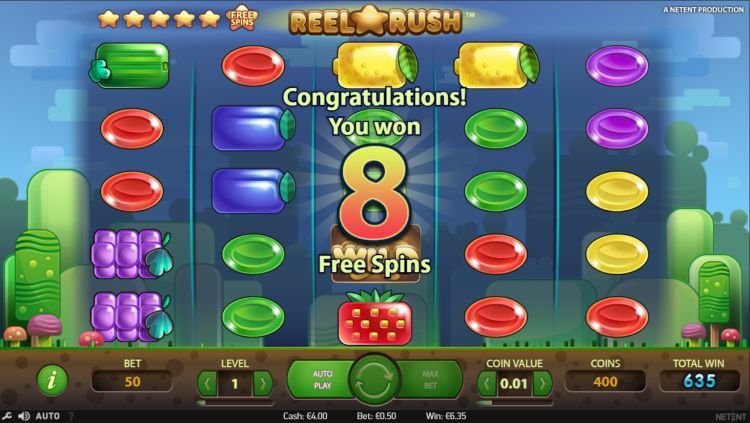 Reel Rush is a real slot for the serious gambler, that can pay you serious money. And it also has a unique game mechanism that allows you to free up an increasing number of ways to win as you progress in the game. How does the Reel Rush slot work? There are no fixed paylines with Reel Rush, but it operates with the “Win All Ways” mechanism. And the fun part is that as you get further into the game, more and more ways to win become available. The playing field starts with a matrix of 1-3-4-3-1 symbols, which amounts to 36 ways to win. With every winning combination, the four inner corners of the playing field are cleared, and that means more ways to win are created. The Wild symbol, which replaces all other symbols play a vital part of this process. If you manage to string together a series of 5 winning spins in succession, then all fields are cleared, and your playing field will now become five reels with five symbols per reel. This amounts to 3,125 different ways to win. You play with a fixed amount per spin with Reel Rush, starting at a hefty $€ 0.50 and going all the way up to $€ 100, per spin. If you are successful in clearing the entire field, you win the free spin bonus in Reel Rush. You now have won 8 free spins with all fields cleared. Because of the wilds that are part of the game and the stacked symbols, chances are pretty good that you are going to get your hands on some sweet and sizeable stacks of cash. And that indeed is the great power of Reel Rush. When you win that free spin bonus you can feel the adrenaline surge through your veins: you know you have made it to an essential point in the game, and you also know that the chance to land the big fish is tantalisingly close. You can smell that money! If you don’t succeed to get that free spin bonus, because you ended up stranded on a series of only four winning combinations instead of five, you will want to chuck your mouse right out the window and let fly some choice words. Sooo close, but not quite there. Thank goodness you do get paid out all the credits you managed to save up in the previous steps. But it just isn’t the same. What are the payout rate and the variance of Reel Rush? The payout rate is very good at 97%. The variance is on the higher side of medium. So be sure to put enough money down before you start playing Reel Rush. The bonus round can be very rewarding, but it doesn’t happen that often. 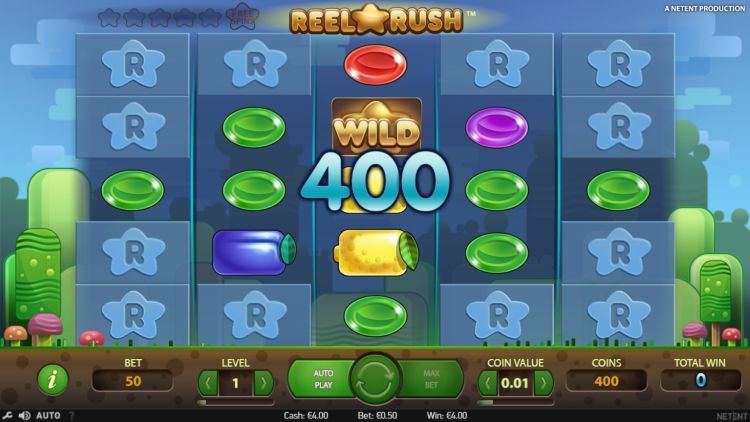 Reel Rush is a true classic by Netent and is a beloved slot with a large group of players. This game can give you a tremendous boost, but it can also be incredibly frustrating, and you have to have the stomach for that. This is the way we like playing Reel Rush a lot, but not too often. For us it is a real Hit-and-Run slot: try to grab that bonus with $€ 20 or $€ 40 and as soon as that happens, grab the money and run. Otherwise, before you know it you dropped your entire bankroll on Reel Rush, chasing that bonus round. Where can you find Reel Rush? The Reel Rush slot is found at all reliable Netent casinos. One of these Netent casinos is Casumo, which is one of our favourite online casinos. 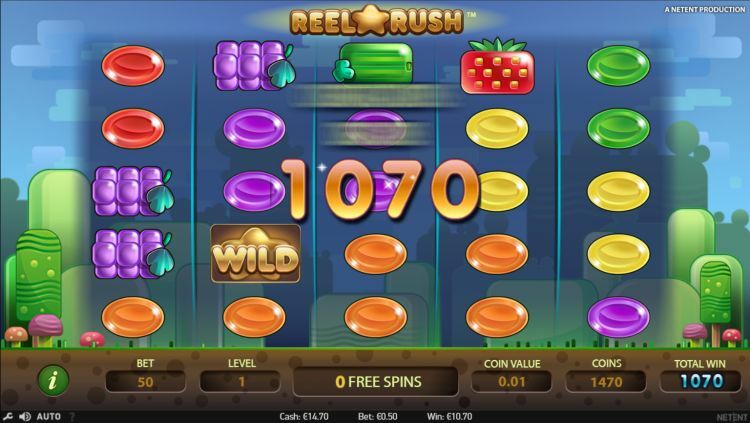 You can play the Reel Rush slot at Casumo with a 200% bonus up to $€50 plus 200 free spins.